Published on December 7, 2018 in general info. 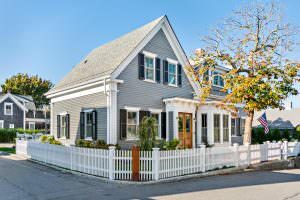 Closed Tags: Cape Cod condo sales, Cape Cod Luxury condo sales, Cape Cod Luxury homes, Cape Cod luxury sales, Cape cod real estate sales, Provincetown condos, Provincetown luxury homes, Provincetown new construction. 11 Tremont Street is a totally renovated single family home on the corner of Tremont and Cottage Street in the West End. It had three bedrooms, three baths and 1,801 square feet. It was listed for $2.350M and sold for $2.5M. MLS Remarks: Location, finishes, amenities: this newly renovated home located in the heart of the West End village checks all the boxes! Situated on a large corner lot with peeks at the water, this home was redone from the inside out by Hammer Architects and Cape Associates builders. Enter the dramatic double front door into a large double parlor, with living room on one side, and formal dining on the other, with custom builtins in between. The high ceilings lend a feeling of spaciousness and the gleaming refinished original pine flooring throughout ties the house together. All new reproduction windows, with raised panel wainscoting on the inside, and functioning shutters on the outside. The kitchen is a chef’s delight, with all custom cabinetry, cathedral beamed ceilings and skylights.